Over the last ten years, Ferrari has become one of the most avantgarde vehicle manufacturers. The successes in Formula 1 have created an extremely high level of technology, aerodynamics and reliability which would have been inconceivable in previous eras. The Viaggio Rosso tours saw the light in 2015, with the objective of transmitting the thrill of driving Ferrari on beautiful streets and enjoying the pleasure which Northern Italy has to offer. 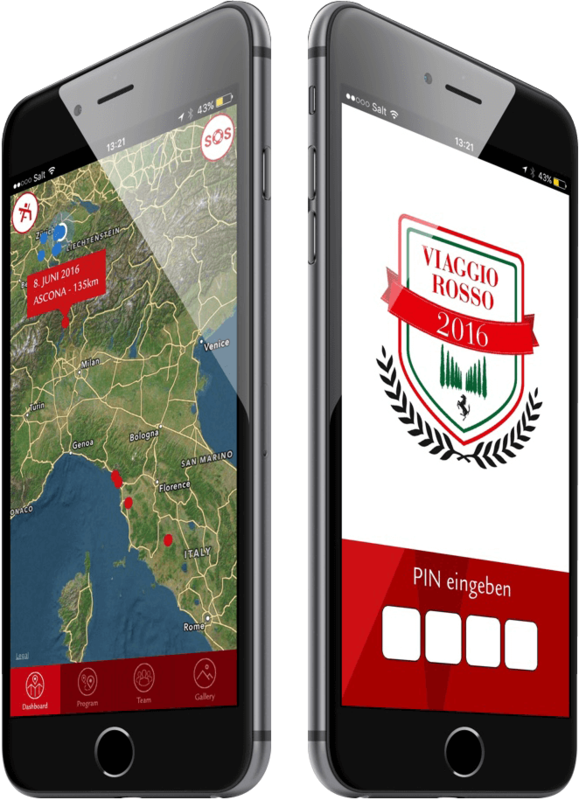 Sharing the love for speed and technological advancement ClickOn and Viaggio Rosso partnered up to modernize the traditional road-book and created the Road Book App. Indeed the paper version of a roadbook is not handy and often gets lost unlike a smartphone. ClickOn proposed the development of an app that replaces the roadbook and enhances the functionality of this old-fashioned print document. The app received all tour details such as the address of the next location, the timeline and a picture of the planned activities. An iOS application was implemented because all users had Apple devices. Since the use of the app is exclusively reserved for the lucky guest of Viaggio Rosso, a publication in the shop did not make sense. A secure link was provided to download the app. In order to unlock the app, a password was sent to the participant by e-mail. The app was ready for use with a playful and useful point of view. In fact, with a simple tip on a program address, the user was able to track the progress of the race and other participants on the map. We also created a gallery where the participants could upload their own photos. A digital roadbook for Ferrari Events. All the participants were always on time and aware of the program. Surprised the participants with something they had never seen.